Cheeseburger defeats Brutal Bob Evans (w/ Tim Hughes) at 7:27. Hughes tries to interfere by helping Evans before the bell, but Cheeseburger thwarts his efforts. Evans survives the initial flurry and controls Cheeseburger for most of the match. When Evans goes to the top rope, he slips, and it didn’t look like he meant to. Cheeseburger hits a Shotei Palm Strike. Another Palm Strike puts Evans on the top rope, and Cheeseburger fights Hughes off again, and then brings Evans down with a Super DDT to get the pin, ending the longest feud in Ring of Honor history, at least it felt like it. This was a fine match for the preshow, as both guys played their roles well. The All Night Express (Kenny King & Rhett Titus) defeat The Briscoes (Jay Briscoe & Mark Briscoe) and The Young Bucks (Matt Jackson & Nick Jackson) in a Three-Way Number One Contender’s match at 9:14. Between these three teams they’ve held the ROH Tag Team Titles 10 times, and eight of those belong to Jay and Mark. The action starts with a brief feeling out process, but things quickly devolve into chaos. Bodies are flying all over both in and out of the ring. Amidst all the chaos, the ANX gets Mark alone and they hit him with a Super One Night Stand to get the pin. Titus sand King are now the top challengers to the Tag Team Titles. Good fast paced action here to kick off the show and putting the ANX over is a good move, capitalizing on their return while it has some heat left in it. Silas Young (w/ The Boys) defeats Dalton Castle at 10:40. These two have been feuding for months, and have made good, natural opponents. Young controls the early part of the match, Castle makes a comeback, and then they alternate control back and forth. The Boys get involved, Castle gets distracted, and Young hits Misery for the three-count. I like these two as opponents, but the story was a little played out by this point and the finish was super uninspired. Michael Elgin defeats Moose (w/ Stokely Hathaway) at 11:48. Both men are powerhouses, and they immediately try to one up each other. Elgin has a title shot on the horizon against Jay Lethal in Japan, so he has a lot to lose here and Moose has everything to gain. Both men throw big bombs at each other and continually show off their impressive strength. Moose survives an Elgin Bomb, kicking out at two! Elgin tries a Buckle Bomb, but Moose pops out of the corner with a Spear! That gets two! Elgin pulls out the big guns and spikes Moose on his head with a Burning Hammer to get the pin. Excellent power display here and a great showing for Moose. Elgin winning was the right call though with his title shot impending. Adam Cole defeats Kyle O’Reilly at 16:07. These two hated rivals take it right to each other and the hatred is palpable. O’Reilly is more aggressive in his approach, while Cole is more calculating. Cole controls more of the match, but O’Reilly continues to fight back and target Cole’s left arm to prep him for the Cross Armbreaker. Eventually, O’Reilly locks on an arm-trap guillotine choke, and falls to the mat. Cole shrewdly forces O’Reilly’s shoulders to the mat and puts his feet on the ropes for leverage to get the pin! Brilliant finish there that keeps both men strong as a babyface and heel and gives reason for them to face each other again. These two were great partners, and they’re also great opponents. ROH World Television Champion Roderick Strong defeats Bobby Fish at 15:17 to retain the title. Strong has been the Champion since 10.23.05, and this is his third defense. These two have very similar styles and they trade strikes and holds back and forth, both appearing to be evenly matched. Late in the contest, Fish locks on the Fish Hook, and Strong taps out on Fish’s leg, but the referee doesn’t see it. Fish thinks he’s won, and Strong corrects him with a hard knee strike to the face. That’s enough to get the pin. This just never got going for me. They did similar stuff to each other, and then they went to the finish. The finish was okay, if ripped off from Undertaker v Brock Lesnar. It makes Strong look like a prick (and a smart one) and keeps Fish as a viable challenger. 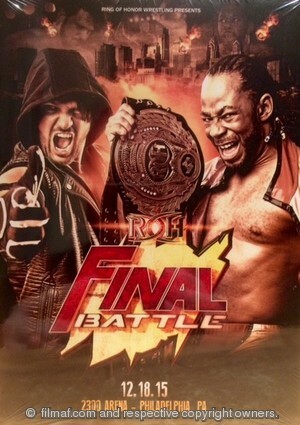 ROH World Champion Jay Lethal (w/ Truth Martini) defeats AJ Styles at 22:08 to retain the title. Lethal has been the Champion since 6.19.15, and this is his seventh defense. The challenger sets the pace early on, as the ROH World Title has been something he’s wanted on his resume since 2002. Would you be surprised if I told you that Martini interfered to give Lethal the advantage? I wasn’t. Styles was widely reported to be having back trouble coming into this match, so that’s where Lethal focuses his energies. Lethal controls a bulk of the match, but Styles stays in it and eventually gets himself back in a good position. He Styles hits Bloody Sunday and then goes for the Styles Clash. Lethal counters by tossing Styles over the top rope and threw a ringside table! Styles just barely gets back in the ring before the count of 20 and he turns right into a Lethal Injection, but it only gets two! Lethal counters a Styles Clash into a Cradle Piledriver (mocking Lynn at ringside) and then another Lethal Injection to finally put Styles away. I complained about the early interference but after that there really wasn’t any, as Lethal won on his own merits, which is a huge victory for him. The story of Lethal working the back was simple but it worked, and they built up nicely throughout the match leading into the finish. These two are amongst the best in the world, easily.